British manufacturer Harris makes fantastic tools and brushes for the decorating trade. Their T-Class Delta range of stripping, filling, chisel and putty knives comes with a lifetime guarantee. This press ad, produced when working at Principles Agency, emphasises the longevity by actually making the T-Class part of the family firm. 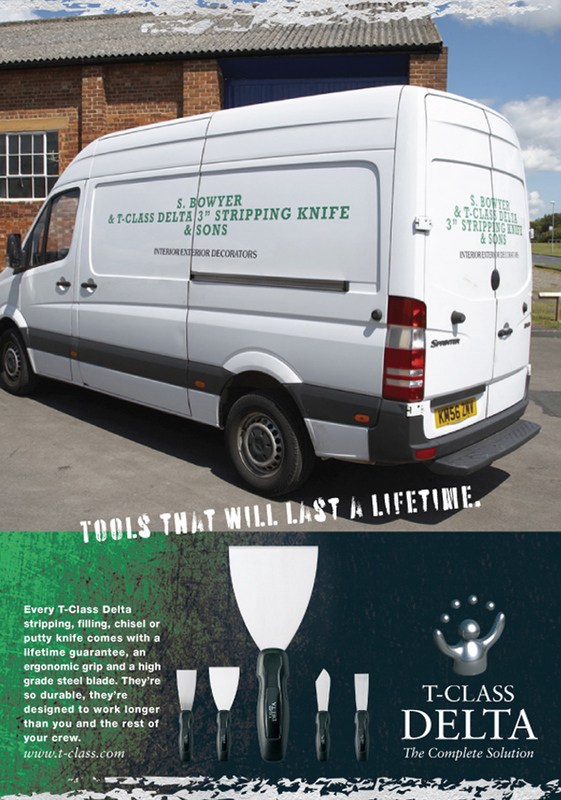 In fact, by proudly adding the name of his T-Class Delta 3″ Stripping Knife on the side of his van, ahead of ‘& Sons’, it shows just how much he rates it in terms of importance. Tools that will last a lifetime. Every T-Class Delta stripping, filling, chisel or putty knife comes with a lifetime guarantee, an ergonomic grip and a high grade steel blade. They’re so durable, they’re designed to work longer than you and the rest of your crew.